Oi! Welcome to our week on Brazil, we had so much fun with this week, my kids have been waiting for the rain forest craft since August! How to say “Hello” in Portuguese – Oi’! Tried to play soccer, but had to do it inside as we had snow all week! Tried to finish our week with a traditional Brazilian meal, but didn’t feel like driving clear downtown LOL! Oh well…it’s the thought that counts! Read Afternoon on the Amazon by Mary Pope Osborne. This is a Matic Gree House book and the kids absolutely LOVED it! I highly recommend! Here’s my whiteboard for the week: We review the facts each day along with locations & capitals of previously learned countries. We learned about the flag of Brazil and completed a mapping worksheet as well. Made a fun Brazilian Rainforest Diorama! Instructions are in my Expedition Earth curriculum and I’ll post on it later this week as well! If you have a Botanical Gardens near you, I encourage you to go and “SEE” the rainforest plants in real life. They’re so beautiful and HUGE! 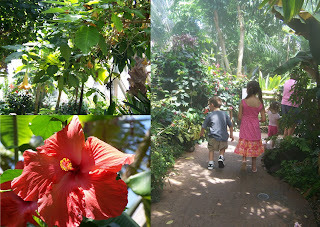 Everything was so big and colorful, it really helped to give an idea of what it’s like in the rainforest! Well that wraps up our week on Brazil! Stay tuned as we head over to Panama next week! Gisele: Thanks for the link :o)Melanie: I think its fine for K – 3rd grade. My preschooler even did it with us this year, I just didn't make her do any of the handwriting, but she learned all the countries, things about them and did all the coloring, cutting, crafts, and cooking stuff :o) She can also tell you how to say hello in most languages we've learned so far.